1 Rinse the chicken and pat dry. Cut the chicken into 6-8 parts. Place the chicken in a large bowl. Peel and finely chop the garlic. Squeeze a lemon and collect the juice. Rinse the remaining lemons in hot water and slice. Mix the lemon juice, lemon slices, garlic, honey, thyme and oil. 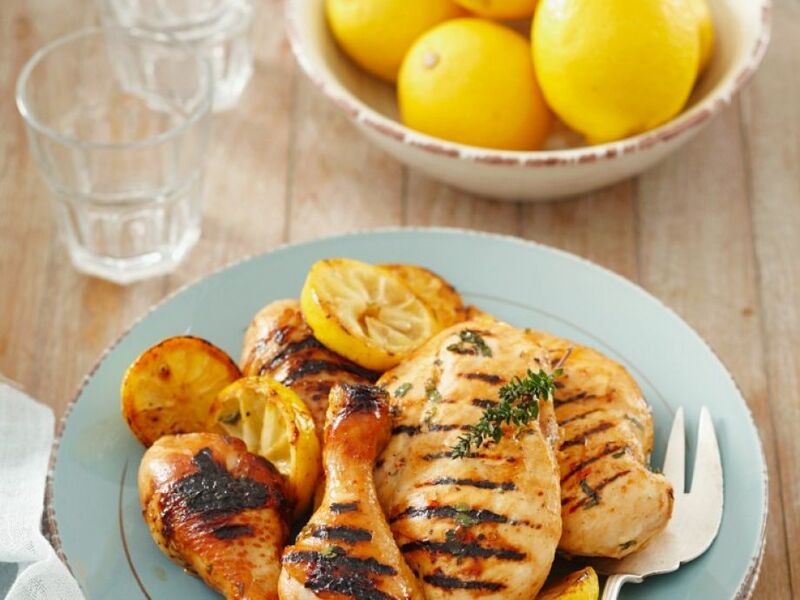 Pour the lemon marinade over the chicken and mix well. Cover the bowl and chill for about 2 hours. 2 Remove the chicken from the marinade and grill for about 20 minutes. Halfway through the grilling time, flip the chicken and brush with the marinade. 3 Serve seasoned with salt and pepper.